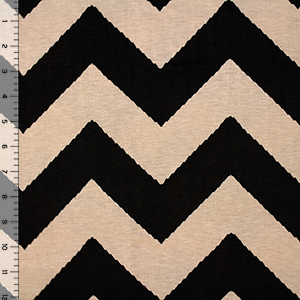 Wider size chevron zig zag design with a hand painted look in black on a neutral mocha color cotton spandex rayon blend knit. Fabric has a soft hand, 4 way stretch, a nice drape, and is lighter weight. Chevron measures 5" (see image for scale). A versatile fabric great for many different applications! **Fabric has slight flaws not allowing regular retail sale as reflected in discount price. Flaws are minor and are intermittent (not in every yard) and may include slight fading, smearing, and print misalignment in areas. Larger yardage orders may not be available in continuous yardage. Bargain fabrics are final sale and no returns or refunds are permitted. **Please note that remaining fabric quantity shown may not be in continuous yardage. Please contact us with any questions prior to ordering.